A Refrigerator/Freezer is a household appliance that uses electricity to run its components which reduce the temperature inside of the unit. A Refrigerator/Freezer has two compartments: 1) the 'refrigerator' compartment, where the temperature will get close to, but not below freezing; and 2) a 'freezer' compartment, where the temperature is cooled to below 32 degrees Fahrenheit (0 degrees Celsius), which is the temperature at which water freezes. The way a refrigerator works is that the coils underneath or in the back of the refrigerator exchange heat from inside the refrigerator to the outside (that's why the areas around your refrigerator feel warm). A motor underneath your refrigerator circulates a liquid through these coils. A Refrigerator/Freezer can be either a large unit (about 6 feet high), or it can be a small unit (about 2 or 3 feet high). 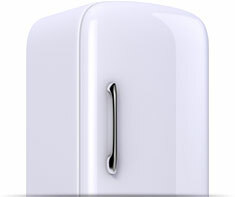 A Refrigerator/Freezer is different than a Freezer (stand-alone). A stand-alone Freezer is a unit that only has a freezer compartment and does not have a refrigerator section. If you have a model that is just a Freezer, then you should instead put a checkmark for 'Freezer (standalone)' as one of your home features in your Home Wizard app. Shown in the 'Routine Care' section are the recommended routine maintenance tasks for your refrigerator/freezer. The 'Q & A' section shows answers to common questions. And the 'Articles' section provides helpful articles about your refrigerator/freezer.